My wife asked me if I'd meet her at IKEA to help her carry some heavy things. I said, "So much for yoga, huh?" Then, after she slugged me, I said, "Sure." 1. This door that looks like it should be labeled "Employees Only"
If you don't think this is weird, you're wrong. The only doors that belong in department stores are doors that say "Employees Only" and doors that say "Restroom." (Given the dual adult-and-child-height-appropriate viewing holes in this one, I'm assuming it's not meant to lead to a bathroom.) Why on earth would you put a door inside an IKEA? Because carrying a ridiculously over-sized yellow bag made of tarp and stuffed to the brim with photo frames, pasta spoons, and oddly-patterned throw pillows isn't hard enough without having to shoulder through a swinging panel of glass, metal, and wood? In case you're wondering, yes, I did go through it. There were no alarms, no flashing lights, and no "Surprise! You're on a new and super boring IKEA reality show by FOX!"es. So disappointing. "Welcome to IKEA! WATCH YOURSELVES, FLIP FLOPS." Anyone who thinks we've triumphed over inequality in America is dead wrong, and this sign proves it. Are you a professional-grade businessman or businesswoman in a smart suit and closed-toe shoes? Then by all means, enjoy our escalator freely! Are you a lazy gadabout who wears sandals on the street and smells like pizza? You'd better mind yourself, Parrothead, accidents happen. Good news! IKEA has stated selling nightmares! Just kidding. These lights aren't for sale. They're peddling terror for free. Just look at these things! They're like the disembodied heads of a Batman villain. And it's not like these Copernican abominations are leering about in the lamp section. 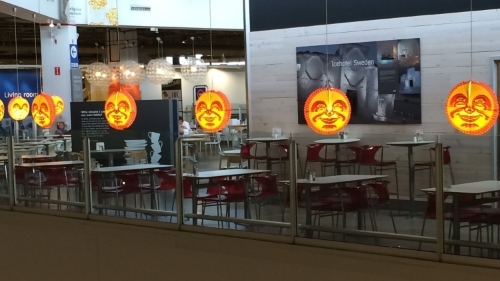 They're hanging over the tables in the cafe, slowly rotating as you slurp down your cinnamon rolls and plates of weird fish. Incidentally, take note of the door in the background of the first nightmare sunbeam picture. "Co-Workers Only." I rest Case #1. Because nothing says, "F*** you, fish!" like wearing an apron covered in fish while you cook up a fish. It's the ultimate insult. I dominate you in every way possible, fish! Culinarily and textilely! What's worse is that this apron isn't even made out of a legit fabric like cotton or polyester or multicolored spandex. It's made of that weird, stretchy, thin, plastic-y material they usually reserve for 99-cent VFW Hall Friday night fish fry tablecloths. This apron feels utterly disposable. Which I guess is the point. 'Cause f*** you, fish. Who's the target market for this artwork? Peoples whose therapists have failed? Victorian street urchins? "If they would rather die, they had better do it, and decrease the surplus population," and all that? Good Lord, IKEA, Scrooge much? And the size of it! Ye gads! It's longer than a football field! Each depressing head is three times the size of your depressed head, for maximum fun house mirror-style taunting. This tapestry is enormous. It's the perfect size to hang off the side of the building that you throw yourself off of when you can't stand it anymore. IKEA is a weird and terrifying place. Frankly, I can't wait to go back.